Just look at the University of Southern California football team. Not only are the physical specimens that make up the Trojans’ roster a group of huge men; the team plays in the massive Los Angeles Memorial Coliseum, a venue that seats more than 93,000 and is historically epic as the host of the 1932 and 1984 Olympic Games. USC looms large in the minds of college-football historians as well. The team has won 11 national championships, claimed seven Heisman Trophies for having the best player in the country, and sent hundreds of athletes on to play professionally in the National Football League. When it comes to college football, there’s little arguing that bigger is better. Schools across the country—a legion of wannabe USCs—are navigating their way into new conference affiliations, all of them looking for a bigger and better deal for their students, faculties and athletic teams. And the deals are being driven largely by squads of 11 behemoths bashing in each other’s heads for control of a pigskin on fall Saturday afternoons. The University of Utah is a canary in the conference-realignment coal mine; the school’s jump from the Mountain West Conference into the powerful Pac-12 is one of the more dramatic examples of upward mobility in the realignment process currently playing out in towns from Syracuse, N.Y., to College Station, Texas, to Boise, Idaho. They are the first school to move from a “small conference,” the Mountain West, into one of the six major conferences: the Pac-12, Big 12, Big Ten, Southeastern Conference, Atlantic Coast Conference and Big East. It makes sense, then, that Utah’s inaugural Pac-12 season would start with a football game against the mighty Trojans, in that historic L.A. Coliseum, on a campus where fans of both the home team and visiting squad crowd into Heritage Hall to get a glimpse of those Heisman Trophies, where thousands gather at the Tommy Trojan statue to follow USC’s legendary marching band toward the stadium, where wandering through the Exposition Park Rose Garden can quickly make people forget they’re on a college campus, let alone at a tailgate scene. More than 10,000 Utah fans decided the chance to watch the Sept. 10 game in person—60 minutes representing the University of Utah joining the “major leagues” of college athletics—was worth the trip to Los Angeles. For a state, and a school, after decades of feeling like outsiders and also-rans, this game meant Utah had officially arrived. Looking around at the thousands of Utah fans dotting the Coliseum during the game, and tailgating across the Los Angeles campus alongside USC boosters for hours beforehand, it was resoundingly clear the Utes and their fans weren’t in Kansas anymore, so to speak. Or, more accurately, they weren’t in Laramie, or Fort Collins, or Provo. The move has been a long time coming for Utah fans and alumni who have seen the east-bench campus evolve from largely a commuter school into a more traditional athletic power—with a vocal and active community of boosters—over the past decade. On game days, the U campus and Rice-Eccles Stadium fill with people from all walks of Utah life, now joined by the common cause of cheering for a football team. And while football—and its affiliated revenue—is the driving force of the U's decision to move to the Pac-12, it is far from the only reason for the mountain school to go coastal. When Chris Hill took over as the U’s athletic director in 1987, the school was still a part of the Western Athletic Conference, a sprawling group of smallish Western schools. Fans recall the ’80s as some dark days for Utah football, when the only guaranteed home sell-out was the BYU rivalry game. Students couldn’t be bothered to actually show up the rest of the season, despite having free access to Rice-Eccles Stadium. Even in that environment, Hill was already thinking of bigger things, like eventually landing in the same conference as USC, Stanford and Cal-Berkeley. The ’90s will be forever known to Utah fans as the heart of the Ron McBride Era, when the former coach turned a downtrodden program regularly pummeled by the LaVell Edwards-led BYU into a competitive crew that often went to bowl games and regularly beat the Cougars, even if the Utes never won an outright conference title under his watch. In 1996, the WAC expanded from 10 teams to 16. Feeling that the conference had become unwieldy, eight of the schools—the U, BYU, UNLV, Air Force, New Mexico, Wyoming, Colorado State and San Diego State—left in 1999 to form the Mountain West. McBride was fired after a losing season in 2002, replaced by Urban Meyer, who, in two years, led the Utes to a conference championship and then to an undefeated season in 2004, making Utah the first school from outside one of the Bowl Championship Series conferences to earn a spot in one of the BCS bowl games—a major windfall both money-wise and attention-wise. Meyer left for a job at Florida, but current coach Kyle Whittingham kept up the winning ways in the Mountain West, leading another BCS-busting campaign in 2008, ending the perfect season with a win against Southeastern Conference power Alabama in New Orleans’ Sugar Bowl. Given the success of Utah’s football team under Meyer and Whittingham, a move to a conference affiliated with the BCS—with automatic access to a BCS bowl game and the money that comes with it—became No. 1 on every Utah booster’s wish list. And when an invitation came on June 17, 2010 to join the Pac-10 and create the Pac-12 with fellow conference-shifter Colorado, it was an easy decision. It will actually be a little while before the University of Utah has much in common with its new conference rivals, financially speaking. 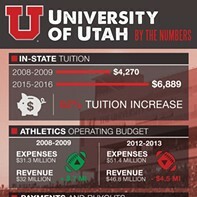 The school joins the Pac-12 fray with the smallest athletic-department budget in the league. But at face value, joining the Pac-12 is most definitely an economic windfall for the U. Consider this: As the Bowl Championship Series is currently set up, the five BCS bowl games—the Rose Bowl, Fiesta Bowl, Sugar Bowl, Orange Bowl and the national championship game—generate $142.5 million from TV revenue and ticket sales, according to David Rudd, one of the U’s authorities on the move to the Pac-12 and the dean of the College of Social & Behavioral Science. Of that $142.5 million, $124.5 is divvied up among the six BCS conferences. The remaining $24 million or so is left to be divided by smaller conferences like the Mountain West.